Here's another from my whitewater calendar of 1994. 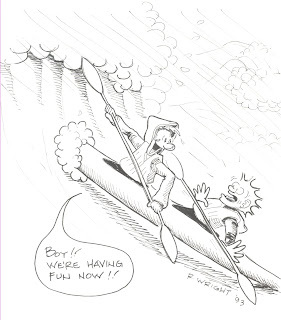 I believe this one was also published in Paddler Magazine, which was then called River Runner. Anyway, I later experienced some rough sea kayaking at Wilapa Bay, and I had about as much fun as the guy in the back seat in this toon. Not much!!! The only difference was that Chris, who was in the front seat was having WWAAAAAY less fun than the guy in this toon. Sea kayaking in rough conditions just isn't that much fun!! It is a lot of work!